The 2010 congressional elections in Hawaii was held on November 4, 2010 to determine who was to represent the state of Hawaii in the United States House of Representatives for the 112th Congress from January 2011, until their terms of office expire in January 2013. 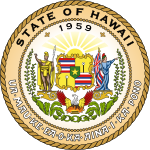 Hawaii has two seats in the House, apportioned according to the 2000 United States Census. Representatives are elected for two-year terms. The election coincided with the 2010 gubernatorial election. Republican Congressman Charles Djou was first elected in a special election in May 2010, which Republicans heralded as a "significant win" and to which DNC Chairman Tim Kaine responded, "Democrats got 60% of the vote in that race. In the November election, it will be one Democrat against one Republican, and we feel very, very confident about winning that race." In the general election, Hawaii State Senate President Colleen Hanabusa, also a candidate in the special election, emerged as the Democratic nominee. Though former Congressman Ed Case, the other Democratic candidate in the special election, was speculated to run again in November, he ultimately decided against it. In the general election, both parties heavily invested in taking the seat, and polls indicated that the race was close up until election day. On election day, however, Hanabusa edged out Djou by a surprising large six point margin of victory and was sent to Congress for her first term. This liberal district that encompasses all of Hawaii but Honolulu, has been represented by Democratic Congresswoman Mazie Hirono since she was first elected in 2006. This year, Congresswoman Hirono faced Republican challenger and Tea Party activist John Willoughby in the general election. Though Willoughby attacked Hirono for refusing to debate, polls indicated that the Congresswoman was a shoo-in for re-election. ^ a b c Haas, Karen L. (2011). "Statistics of the Congressional Election of November 2, 2010" (PDF). ^ Woo, Stu (2010-05-24). "Republican Wins Hawaii Seat". Wall Street Journal. ISSN 0099-9660. Retrieved 2019-02-25. ^ Miller, Sean (2010-05-30). "Ed Case ends his campaign for Hawaii House seat". TheHill. Retrieved 2019-02-25. ^ a b Sugimoto, Minna (October 25, 2010). "New poll shows Djou, Hanabusa neck & neck in Congressional race". Hawaii News Now.